There I was relaxing next to my tent, soaking up some rays of sunshine, when a not often heard, but familiar, sound reached my ears. I knew the Clacton Airshow was on, and had seen a few aircraft that I couldn’t name fly over head, but I certainly knew what these were: Spitfires, and a pair of them at that! Very graceful and incredible to think that they are still flying after all these years. But that’s down to the dedication of many people, no doubt. A privilege to see and hear them at such close quarters, and from the comfort of my own camping chair. 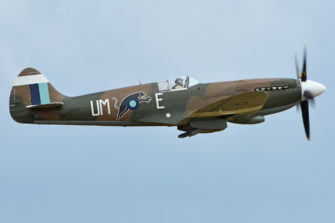 Photograph of Spitfire by Alan Wilson used under Creative Commons (Attribution-NonCommercial) licence.